Poor cleaning and pressing methods can destroy your suit. At Cameo Cleaners, your suit cleaning needs are given the utmost care and attention. Fragile or irreplaceable buttons are removed prior to cleaning and hand-sewn back on afterwards. Your suit is then hand-steamed to make it look like new. Cameo Cleaners’ delicate cleaning process prevents wear and tear while extending the longevity of your best suits. Professionals should always handle the cleaning of silk ties; otherwise, one mistake could ruin your precious tie. Improper cleaning methods used by ordinary dry cleaners can change the look and feel of this valuable accessory. 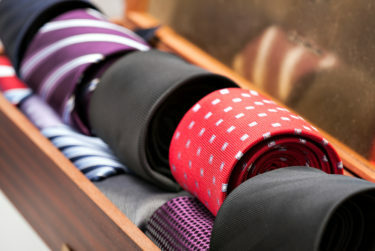 Let Cameo Cleaners handle your tie cleaning needs. Whether the culprit is spilled wine from a celebratory dinner or from an everyday messy routine, Cameo Cleaners will ensure your ties are spotlessly restored.